Return to this webpage for details and online registration sometime during the spring of 2003. The format will be similar to the Cruiser Challenge IV, so you can get an idea from browsing this site. Details of the Schedule and On-line Registration will be posted here in Spring of 2003. Stay tuned! Pictures and Email comments are here! Cruiser Challenge 2002 - The Biggest One Ever! More than 50 mini-, micro- and pocket cruisers registered for this year's SCA Cruiser Challenge. More than a hundred sailors will be racing and cruising with us on beautiful Monterey Bay -- and partying with us at Monterey Pennisula Yacht Club. Skipper Bill Teplow just returned home this week from sailing his Potter-19, "Chubby," single-handed from San Francisco to Hawaii. The voyage took 24 days. Bill will speak about the trip and answer questions at the SCA Cruiser Challenge Brunch on Sunday. After the races, the party begins. Saturday night we'll have the Award Ceremony and dinner at the Monterey Peninsula Yacht Club. 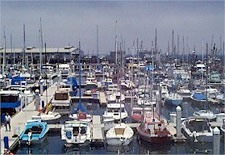 We'll be staying overnight at the Monterey Yacht Harbor. On Sunday morning, we'll have brunch at the Monterey Peninsula Yacht Club. There'll be plenty of free time for daysailing after brunch on Sunday. You don't have to race to join the party. If you'd rather daysail than race, that's fine -- come and join us! Just check off the appropriate boxes on the registration form for the activities you want to attend. The deadline for Registration has been extended to August 10th! You must pre-register and pay the $15 entry fee by August 10th to attend. Non-racers pay only $5. Please check in at the HarborMaster's office as soon as you arrive for your berthing and parking space assignment. Please don't park any where besides in your assigned place. Arrive before 9 am and park, rig and launch at the Monterey Yacht Harbor. Pay for parking and your berth at the HarborMaster's Office. Berth is $15/night. Parking is $12 per calendar day for your vehicle and trailer. If you arrive late, you may have to park in over-flow parking. Dock key deposit is $25, refundable. Tie up at your assigned slip/raft up location. Please bring extra fenders and lines for rafting up. We will pass out course maps and explain the starting sequences. 4:pm - Bar opens at MPYC The cash bar at Monterey Pennisula Yacht Club opens. The Buffet Dinner will start at 5 pm and continue thru 7:30 or 8 pm. Due to the large number of participants this year, we can't all fit in the MPYC dining room at the same time! So we urge you to come early, eat, and then move to the bar or deck area. 7:30 pm: Award Ceremony at MPYC The Award Ceremony begins! Coffee service only starting at about 7:30 or 8 am. Special Guest Speaker: Bill Teplow, who has just returned home after sailing his Potter 19 singlehanded from San Francisco to Hawaii. Time for socializing over coffee. $7 per person; children age 12 or younger half price.